One of the greatest uses for a DVD burner is recording your old home movies onto recordable DVDs. This is something that used to be out of the realm of the consumer, require expensive video capture devices, and cost a bundle in supporting hardware. Not any more; any current model PC based on the Intel Pentium 4 or AMD AthlonXP/64 processor has more than enough power to help you turn your old VHS or BETA home movies into shining works of DVD glory. If you have a handy cam, or another type video camcorder, a DVD burner is the perfect accessory for your PC to allow you to transfer those home movies onto disc. As DVD players are just about as common as VCRs these days, it makes it much easier to share your moments via DVD than ever before. To help facilitate this transfer you will need software, and thankfully for the consumer, the Aopen DRW8800 comes with a couple of programs you'll definitely need. Nero5 enables you to burn to a CD-R/RW, or recordable DVD media for starters. PowerDVD allows you to play back standard DVD movies you might rent, or record yourself. Videostudio is an entry level editing program which will allow you to add in a few titles, edit your videos, and in general clean things up. NeoDVD is a simple little program to help you with the transfer of your videotapes to the PC, into a digital format which can be edited and later burned to a recordable DVD. 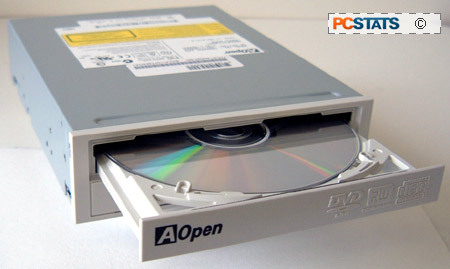 Today we're going to be checking out one of the latest dual format DVD writers, the AOpen DRW8800 drive. It's capable of writing to DVD-/+R discs at up to 8x speed, DVD-/+RW at 4x while burning CD-R media at 32x and CD-RW's at 16x. 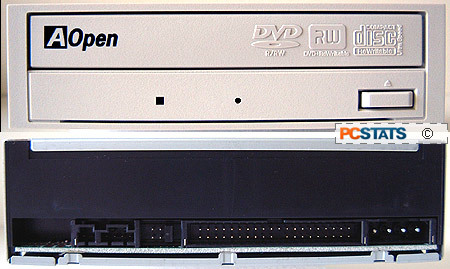 The Aopen DRW8800 can read DVD-ROMs at 12x, DVD+/-R at 8x, DVD+/-RW at 8X, DVD-Video at 5X, CDROM at 40X, CD-R at 40X, and CD-RW at 32X. Included in the package is an analog audio cable along with four mounting screws and a user pamphlet to help you though the steps installing the drive in your PC. In terms of software, AOpen toss in a disc with VideoStudo 7, PowerDVD 5, Nero Burning ROM, NeoDVD (for making home movies into DVD movies) and InCD Packet Writer. The complement of programs should give you all the basic software tools to incorporate your old home movies into DVD format, provided you have the necessary hardware such as a videocard with Video-In port. Some might think the AOpen DRW8800 DVD burner is plain looking, but personally I like it. The front bezel is beige, and the uncluttered. If you're one to listen to audio CD's through the optical drive itself, you should take note that the AOpen DRW8800 does not have a headphone jack. The Aopen DRW8800 measures in at 19cm in length, and weighs a little over a pound. The rear of the drive looks like every other optical device on the market; there is a two pin digital audio port, four pin analog audio header, the master/slave/cable select jumpers, the IDE port and molex power connector. The drive is compatible with all the usual writing methods like Packet writing, TAO (Track at Once), DAO (Disc at Once), SAO (Session at Once), Multisession, Variable Packet Writing and Fixed packet writing methods. Because recordable DVD drives may be mounted on their side, the DRW8800 has small clips on the disc tray to keep the CD or DVD in place when in the vertical position. During testing, the drive was extremely quiet and vibration was kept to a minimum... but the burner did produce quite a bit of heat. I'd recommend keeping a free slot below the Aopen DRW8800 when it is installed into the 5.25" port for ventilation.